Hi! Today I have a sparkly creation for you – I hope you like it! I just love how this tree sparkles like it is in the midst of a snowfall. 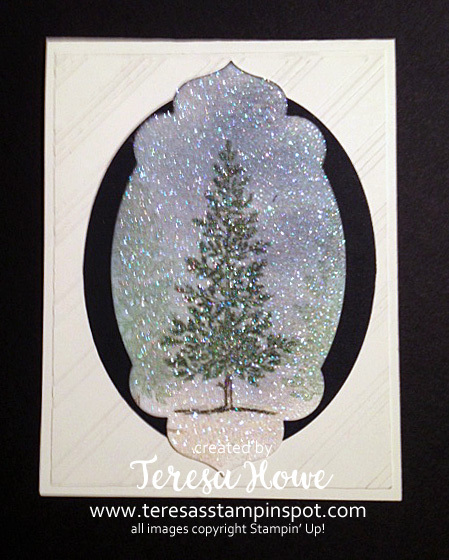 To achieve the look – stamp your tree (I colored my tree with markers – Garden Green and Chocolate Chip) and stamp it in the center of your card stock. Without reinking, stamp again to the left and right. Sponge Night of Navy around the tree for the sky. Next, apply Versa Mark over the entire image by running the pad directly over the paper. Sprinkle Heat & Stick Powder to the VersaMark and then heat gently to melt. Quickly sprinkle on Dazzling Diamonds glitter, tap off excess and then heat gently to adhere the glitter. Pretty simply and oh so pretty! I did use a retired die from the Apothecary Accents set to die cut my tree but you could easily do this with the Layering Ovals set and/or if you were able to purchase them in November, the Stitched Ovals. If you still have a crafty friend to buy for this year, consider giving them a gift of Paper Pumpkin – this is a sweet box that arrives once a month to their door filled with a little crafty break – complete with stamps, ink, papers, card stock and embellishments. Each month is a different kit. Subscriptions can be for 1, 3, 6 or 12 months. Stampin’ Up! will even send you an email with a gift certificate that you can print out to give to your recipient! Can’t get any easier than that! I’m sorry, I’m confused. Beautiful card. How did you use the masks to decorate your background? Could I have the measurements of your Very Vanilla panel? I really would like to make this card. Thank you for sharing! The Very Vanilla Panel is 4 x 5 1/4″. I used the Striped mask and ran my bone folder along the edges of the stripes to get the embossed look – lay the panel on top of your piercing mat or any other foam pad. If you have the retired striped embossing folder, that would work as well.